Perhaps you’re thinking of selling silver coins, silver jewelry, or silver flatware. If so, you’re at to the right place. Yavapai Coin and Jewelry buys silver coins, silver rounds, silver bars, casino token, silver jewelry, silver flatware, scrap gold, gold watches, class rings, platinum jewelry, gold nuggets, and much more. If it’s made of gold, silver, or platinum, we will buy it. While silver prices are lower than gold prices, silver coins, and silver flatware are pretty heavy. 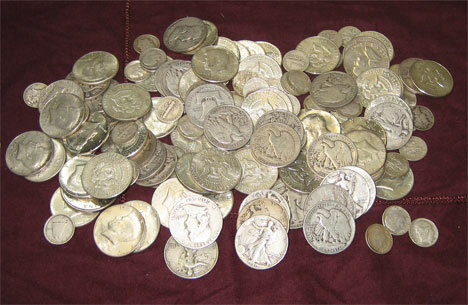 A few silver coins can add up to several hundred dollars in a hurry. While we hate to see anyone selling their silver coins, if you need to sell your silver, we’re always buying silver. We’re also buying Morgan Silver Dollars, Peace Dollars, Mexican Libertads, American Silver Eagles, Canadian Silver Maples Leaf’s, Australian Kookaburra’s, Chinese Panda’s and many other silver bullion coins. While many silver coins have value only for their silver content, occasionally we have a customer who brings in a special coin that we can pay more than spot price for. Recently we had a customer bring in 2 dimes that we bought for $200.00 each. If you’re thinking of selling silver coins, silver bars, silver rounds, casino tokens, silver flatware, silver jewelry, or any other silver, just stop by anytime. You may also like this article on Sterling Silver Marks. At Yavapai Coin and jewelry We’ll test your gold, silver, and platinum as you watch. We’ll weigh it on a State Certified Scale, and give you an immediate appraisal of your item’s value. If you need to sell gold jewelry, silver, platinum, coins, or any precious metals, stop by our store at any time. We’re open Monday - Saturday from 10 a.m. to 6 p.m. Call 928-710-2137 for information. If you’re ready to buy some silver coins, stop by the store, as well. We always have some type of silver copins, silver bars, or silver rounds available.